Rachael Dunlop receives funding from The Institute for Ethnomedicine, WY. She is a Vice President of Australian Skeptics and an administrator of the Stop The AVN Facebook page. The heated battle between Australia’s anti-vaccine lobby, the Australian Vaccination Network (AVN), and those fighting against its misinformation took a positive turn late last week, with the New South Wales Department of Fair Trading ordering the AVN to change its name or risk being shut down. The move follows what has been described as “numerous” complaints from both the public and the Australian Medical Association that the AVN name was misleading the public and wasn’t an accurate representation of its activities. The order was hand delivered to the home of Meryl Dorey, AVN president, spokesperson and public officer, just before midday on Friday. Publicly, the AVN claims to be pro-choice and a “vaccine safety watchdog”. And its name gives the impression of a neutral resource for vaccination information, but scratching the surface of its slick-looking website quickly reveals an anti-vaccine agenda. A 12-month investigation of the site by the NSW Health Care Complaints Commission, found the AVN website, “provides information that is solely anti-vaccination, contains information that is incorrect and misleading, and quotes selectively from research to suggest that vaccination may be dangerous.” This resulted in the publication of a public warning advising people not to get their medical advice from the AVN. 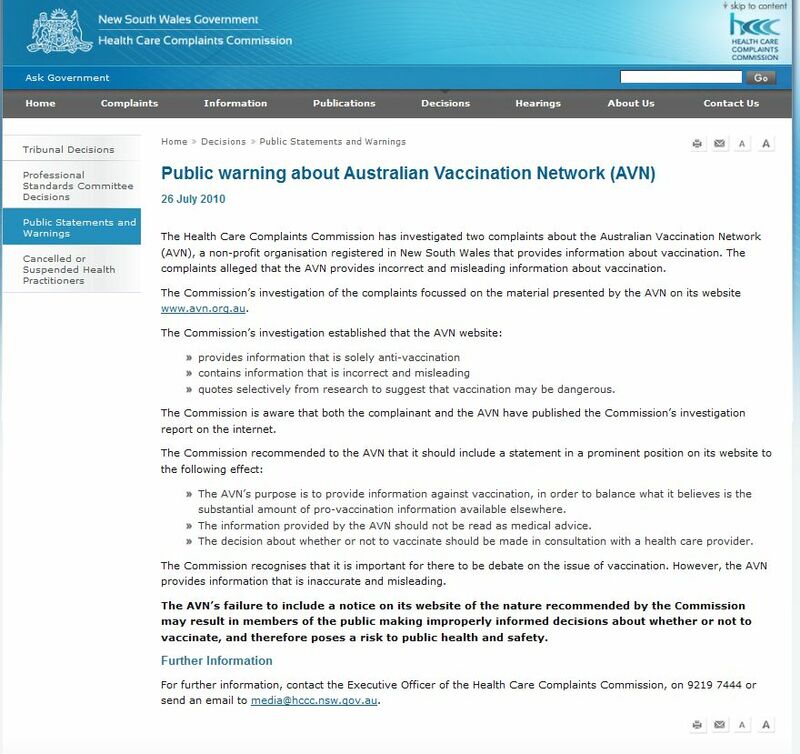 The AVN later challenged the public warning and won, however during the case the Judge was not convinced by Dorey’s claims “to educate her subscribers and the general public into making decisions about vaccinations”. As Justice Adamson put it, “It seems slightly coy that your client is so shy about admitting what it is on about”. Further evidence for the Judge’s suspicions come in the form of T-shirts sold on the AVN website emblazoned with “Love Them, Protect Them, Never Inject Them”. And a children’s book called Melanie’s Marvellous Measles which teaches children to embrace infectious diseases! The issue of the misleading name has led to confusion for parents and professionals alike, with The Australian College of Midwives a recent victim. It mistakenly sent out invitations to all its members (which were later withdrawn) for an AVN seminar, as it was unaware the AVN was an “anti-immunisation lobby”. Dear Meryl, I was attracted to the AVN several years ago because the name suggested that you might be a reputable source of information about vaccination (I was preparing for an overseas trip). I found nothing of the sort on your site…..I was indeed misled and deceived by your name. And I’m not the only one. They are actually anti-vaccination, and they should put on every bit of their material that they are anti-vaccination in great big words. They have every right for that belief but they should communicate it clearly so people are not misled. Yet, the practice of anti-vaccine groups using misleading names is not new. In the United States there is the National Vaccine Information Centre or NVIC, (which refers to itself as a vaccine watch dog) and in New Zealand there is VINE or Vaccination Information Network. And it’s pretty obvious why they are so keen to disguise their true agenda – I can’t imagine parents looking to the Anti-Vaccine Network for unbiased advice (although kudos to the Australian media, as the AVN is increasingly being called this). The AVN now has until February 21, 2013 to submit an application for a name change which also must be approved by the Commissioner. Of course, Dorey and co have a right to appeal this order, but if they decide to ignore it, their registration can be cancelled and their assets seized and split up – making this a rather serious matter indeed. So far, Dorey has responded to the order in the only way she knows, with accusations of “suppression of free speech” and “government bully boys”. And in a bizarre analogy she questioned why she was being targeted when “Greenpeace is not green, nor do they go around looking for peace…”. What we are asking this organisation to do is be upfront and honest with people and stop misleading people … for far too long this organisation has been misleading individuals and getting away with it. These people aren’t about pro-choice, these people are about pushing an anti-vaccine line. So here’s my suggestion for the AVN: change your name to the Anti-Vaccination Network. That way there can be absolutely no confusion about your agenda and you get to keep you domain name. Because you’re not fooling anyone anymore.